9th June 2014 – Current world 1500m leader Hellen Obiri (KEN) once more showed great finishing speed at the Kenyan Commonwealth Games Trials. 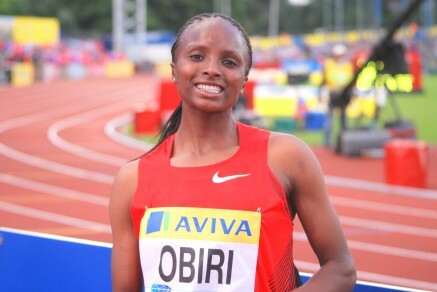 Needing to finish in the top three to guarantee section for the championships in Glasgow later this year, Obiri left nothing to chance and crossed the line first in 4:04.8 to book her ticket. There was a breakthrough for current European Junior 200m Champion Dina Asher-Smith as she dipped inside 23 seconds for the first time. Representing her club in a UK Womens League fixture Dina convincingly won the race and clocked 22.98 seconds. At the IAAF Challenge meet in Hengelo, Schillonie Calvert (JAM) clocked a season best to take third in the womens 100m while Kimmari Roach (JAM) equaled his PB of 10.12 in the mens event. At a separate IAAF Challenge meet in Marrakech, Kemar Bailey-Cole (JAM) placed third in the 100m.